Hey Folks ! After a month without posting and digging the books for my exams I am back with yet another great post on how you can add some cool buttons under every post of your blog. These buttons are made of pure CSS and look extremely elegant. They have cool hover effect and are very light too. You can add these buttons under every post of your blog and increase the user interaction in your blog. The demo of the same can be seen just below. After seeing the demo in order to add these buttons under every post follow these steps. Now we have to add the HTML. After adding the codes save the template. You are done now. 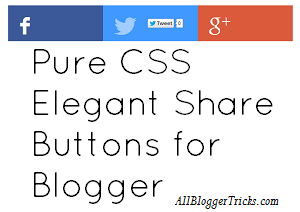 Now you and your visitors can see these awesome and elegant pure CSS share buttons on your blogger blog. Great css sharing widget. It looks good on my blog. But can you please tell me how to change the width and height of these boxes ? Hi, your shared css and HTML works for me. but I am unbale to continue. I need more button like shareholic which I currently used atleast with 5 to 6 top sharing option. Are you planning for doing such a thing in future? Once again thank you verymuch for sharing. Can you make a post on how you put the bottom Share Box, when reader completes its post it just popups from bottom! I really liked it and want it.. with your new social share! Please make a post.. Thanks!! Hey is this possible to place the whole code in a html widget instead of placing it to template html. Will it work fine? Hey bro!!!! need your help.